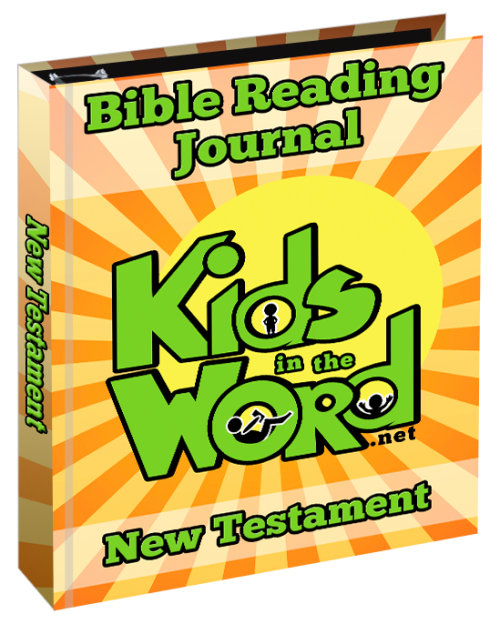 Updated: Get the New Testament Bible Reading Journal at Kids in the Word! 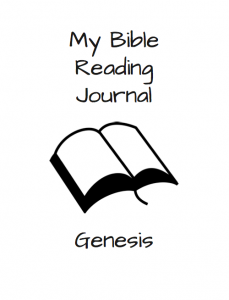 Jonathan has been reading through Genesis using the method I described here. 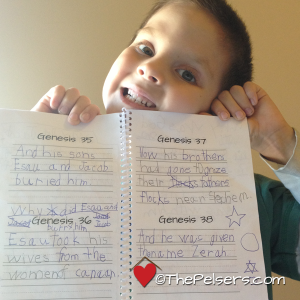 He's been starting his school time each week day by reading one chapter and writing in his journal. He's in Genesis 46 this morning and so excited that he has almost finished the book of Genesis. He says he wants to read Exodus next. As you can see, we get some doodling in addition to journaling. 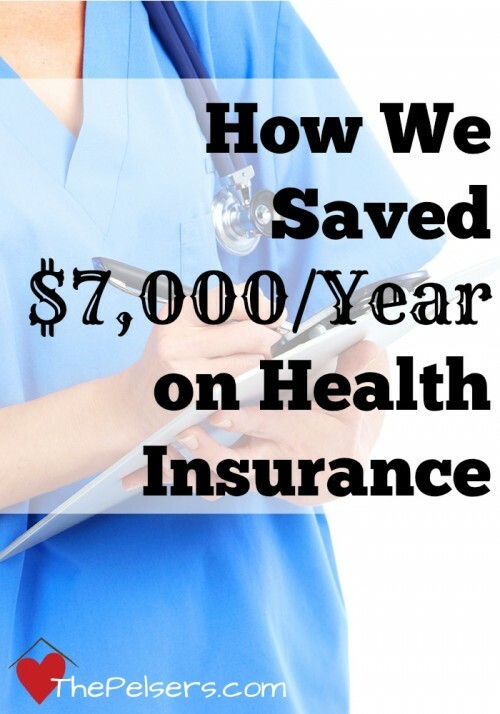 We're using this simple printable that I created. Each page is half of a letter sized sheet of paper and I bound his using my coil binder. You could staples yours or use a 3 hole punch and a small binder. I used cardstock for the front and back covers to help it last longer. 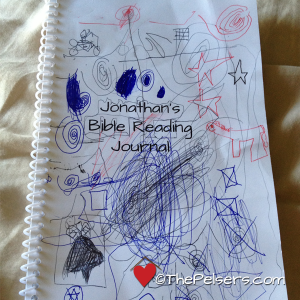 The cover of Jonathan's is also personalized with his name… and lots of his doodles! 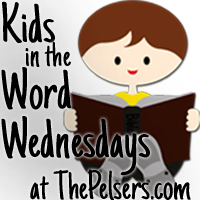 How have you kept your kids in the Word? 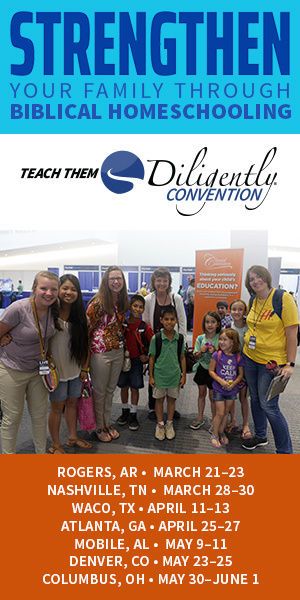 Share in the comments and/or link up a blog post on kids and Bible, character, or worldview. While adding a link, my keyboard skipped a few letters. It should read, “respect God’s house”. Wasn’t sure how to fix it, sorry! Glad I found your sight! That’s ok. I’m not sure I can fix it either, but I’ll try. Brilliant! Thanks so much for sharing. Think I’m going to make them for my 7 and 5 year old children! Awesome. Come back and tell us how they like reading and journaling. I’m planning to do one for Exodus, but it won’t be ready until next week at the absolutely earliest. I absolutely love this!!! I am going to start it with my students next week!!!! I hope you will continue to prep it for all books so I can continue all year long! I love it! Thank you!!! Genesis and Exodus are now available. I’ll likely continue with whatever book Jonathan wants to read next. Love this idea! Have you converted to the regular lines? If so, I would love a copy of it. Meggen, not yet. It is on my to do list for the new KidsintheWord.net site.